At Hemingway Medical Spa we provide a comprehensive assessment of your feet and toenails and discuss all of the treatment options available. Treatment options include prescription topical anti-fungals, oral anti-fungals, surgical debridement, and 1064 Nd:YAG laser treatment with the Pinpointe Foot Laser. If you would like to learn more please call our office. Now available at Hemingway Medical Spa, The Pinpointe Foot Laser is a safe, non-invasive treatment option for Onychomycosis. This laser is well-tolerated with minimal side effects. The most common reaction is that “there is a feeling of warmth”. This treatment is effective and requires only a single treatment. Onychomycosis is a disorder of the nail that is commonly caused by yeast, dermatophytes (tinea unguium), or non-dermatophyte molds. Dermatophytes are a fungal micro-organism and are responsible for some conditions such as “athlete’s foot” (tinea pedis), “jock itch” (tinea cruris), and scalp “ringworm” (tinea capitis). Onychomycosis is common and affects up to 8% of the population. Existing treatment options for onychomycosis include topical anti-fungal products, such as: terbinafine spray (Lamisil), and efinaconazole (Jublia®). A considerable disadvantage to the topical route is that the effectiveness is limited, specifically when the nail has thickened. At this point, the medication cannot penetrate to the infected area. In addition to effectiveness, cost of this treatment should also be examined. Another option for patients is the use of oral anti-fungal medications. These generally require a minimum treatment time of 12-24 weeks. The efficiency of these medications are variable. For example, increased risk of liver damage is possible with overuse. In these instances, alcohol cessation is recommended to accompany this treatment choice. There are other nail conditions that may have similar symptoms as onychomycosis, however, they are in fact an entirely different diagnosis’ which may require a separate type of treatment. Therefore, it is important to identify the proper diagnosis and treatment plan. At Hemingway Medical Spa, Dr. Olesen provides a complimentary consultation for patients experiencing this condition. In clinical studies, 68-81% of patients claim a clear nail(s) in the 6 and 12 month after treatment with the PinPointe laser treatment. Additionally, 81% of patients had sustained improvement at 12 months. A total of 71% of patients experienced continuous improvement. It is important to remember that toenails grow slowly, and it is only the new nail growth that will be free of fungus. Therefore, results are not immediate and can often take up to 3-6 months to notice improvement. Utilizing principles of selective photothermolysis (zapping only the intended area) kills the fungal layer. A series of high definition of photographs will be taken to document the “before” and will be used as a baseline comparison at your follow up visits. At this time, debridement of excess nail tissue will be done to facilitate ensure penetration of the laser is accurate. This is done using surgical grade equipment such as nippers, drills, burrs, and currettes. After debridement, the laser is used on each individual toenail. This is done to avoid risk of contamination by fungus that may be residing on adjacent nails. Follow up at 3 months and 6 months for repeat debridement if required. 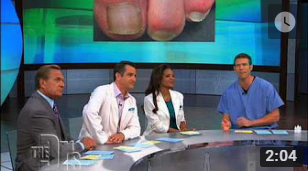 Onychomycosis is typically a long-standing disorder that has developed over years. Therefore, although the laser treatment will kill the fungus, it is up to the patient to prevent re-infection. Following the post-treatment care instructions is paramount to achieving optimal results.